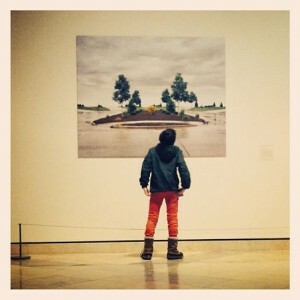 The author, studying “Chelsea Court,” by Cory Prahl, at the MIA. Isaac Lowenthal Walsh is the true author of this post. He’s 11, though, a student in Minneapolis, and he doesn’t have a publicity photo or an official bio—yet. What he has is insight beyond his years. (In March, he reviewed Half Pint, the MIA’s new family restaurant.) And when he trained his eyes on two artworks at the MIA that leave much to the imagination—Cory Prahl’s “Chelsea Court,” from 2009, and René Magritte’s “The Promenades of Euclid,” from 1955—he sought to untangle the mysteries of their meaning while reveling in the possibility that they might be unsolvable. What could be more inspiring, after all, to someone who is just learning the rules than realizing that you can break them, with astonishing results? Here, he explains what surrealism means to him. From a distance, everything appears different than up close. 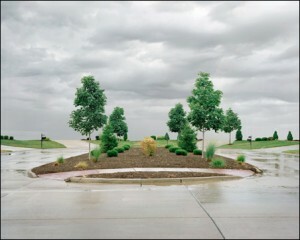 In “Chelsea Court” (2009), a photograph by Cory Prahl, I see a small suburban cul-de-sac with a pristinely planted and groomed median, some driveways, and a few hedges and trees. Peering closer, I can see that the absence of houses makes this Photoshopped picture completely absurd, and I get a strange, unmistakeable feeling of insecurity. At the same time, however, this sensation draws me in, and I begin to wonder…. How long has it been since someone was last here? Is something being hidden from me? I would assume this reaction is exactly the response Rene Magritte was trying to get out of his painting, “The Promenades of Euclid” (1955). 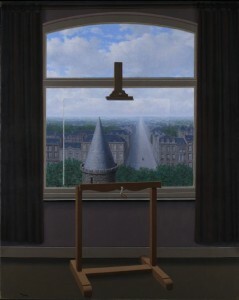 Shooting a quick glance at the painting, I see a bland cityscape and tower through a window, with the top half of an easel floating in mid-air. Upon further examination, I see a canvas that has been painted to camouflage perfectly with the background, or so it seems. I don’t know what is hiding behind that canvas. The fact that the artist made sure the tower roof and the road are exactly the same shape and are perfectly symmetrical adds another element of curiosity. “Chelsea Court,” a photograph by Cory Prahl from 2009. Looking even deeper into “Chelsea Court,” the seemingly perfect median reveals weeds, crumbling curbs, and yellowed grass. The scene is completely devoid of signs of human life, which creates another level of uncertainty. Where is everyone? Where is this place? Do people know of this strange suburban cul-de-sac? Similarly, in “The Promenades of Euclid,” no life is evident except for two solitary figures in the street below. There are no cars in the street, no liveliness with the exception of the long line of houses and buildings up to the horizon line, which is where, ironically, the apex of the tower ends. I can tell that Prahl and Magritte thought this out extremely well, each man trying to convey his opinion on a different topic, one that only the artist knows. Similarly, each viewer will find his or her own meaning in the two artworks—I find a lot of inspiration in being able to say that. I personally find “Chelsea Court” and “The Promenades of Euclid” depressing but also powerful. I think I would like to visit “Chelsea Court.” The scene appears to have quite a bit of untold story behind it, with the absence of the houses, and its mix of flat-out strangeness and inspirational potential entices my 11-year-old spirit for more exploration. “The Promenades of Euclid” by René Magritte, from 1955. “The Promenades of Euclid” furthers this need for more knowledge by taunting me constantly with the mystery of what is behind the canvas. For all I know, I might be looking at a see-through canvas, or the canvas could just be suggesting what the artist imagines is there. A totally bizarre and creepy scene could be taking place behind that canvas. When I consider that the tower and road are almost too perfect, being completely symmetrical, almost cutting the painting in half, and the horizon line runs exactly across the middle of the painting, cutting it in half again, I suspect Magritte is up to something. But if he is trying to hide something from us, he obviously didn’t think about what might look suspicious. Comparing these artworks has opened a new door for my train of thought, and unlocked many questions for the first time. Before this assignment, I didn’t think I’d ever been “inspired” by art. But I remember walking up the stairwell, glancing over my shoulder at “Chelsea Court” and without a second thought saying “Mom, let’s go look at that one. It’s cool.” Sometimes, seeing things from a distance pulls us in to examine them up close.